Washington, D.C., October 17, 2017 - The U.S. government had detailed knowledge that the Indonesian Army was conducting a campaign of mass murder against the country’s Communist Party (PKI) starting in 1965, according to newly declassified documents posted today by the National Security Archive at The George Washington University. The new materials further show that diplomats in the Jakarta Embassy kept a record of which PKI leaders were being executed, and that U.S. officials actively supported Indonesian Army efforts to destroy the country’s left-leaning labor movement. The documents concern one of the most important and turbulent chapters in Indonesian history and U.S.-Indonesian relations, which witnessed the gradual collapse of ties between Jakarta and Washington, a low-level war with Britain over the formation of Malaysia, rising tension between the Indonesian Army and the Indonesian Communist Party, the growing radicalization of Indonesian President Sukarno, and the expansion of U.S. covert operations aimed at provoking a clash between the Army and PKI. 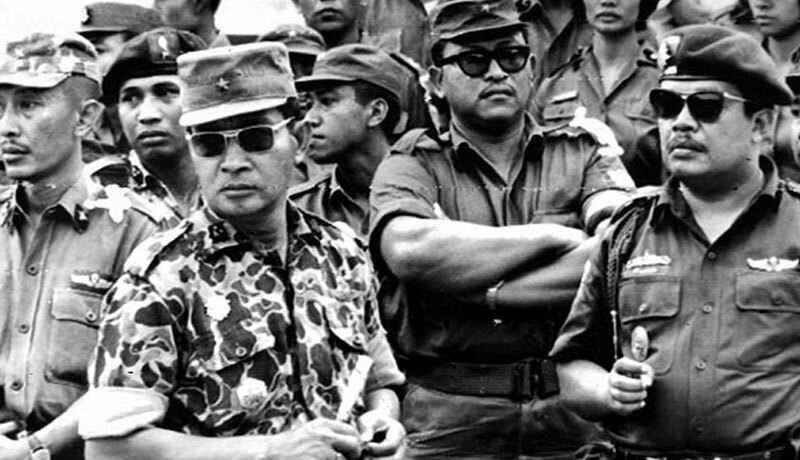 These tensions erupted in the aftermath of an attempted purge of the Army by the September 30th Movement – a group of military officers with the collaboration of a handful of PKI leaders. After crushing the Movement, which had kidnapped and killed six high-ranking Army generals, the Indonesian Army and its paramilitary allies launched a campaign of annihilation against the PKI and its affiliated organizations, killing up to 500,000 alleged PKI supporters between October 1965 and March 1966, imprisoning up to a million more, and eventually ousting Sukarno and replacing him with General Suharto, who ruled Indonesia for the next 32 years before he himself was overthrown in May 1998. In an unprecedented collaboration, the National Security Archive worked with the National Declassification Center (NDC) to make the entirety of this collection available to the public by scanning and digitizing the collection, which will be incorporated into the National Archives and Records Administration’s (NARA) digital finding aids. When completed, scholars, journalists, and researchers will be able to search the documents by date, keyword, or name, providing unparalleled access, in particular for the Indonesian public, to a unique collection of records concerning one of the most important periods of Indonesian history. Of the 30,000 pages processed by the NDC, several hundred documents remain classified and are undergoing further review before their scheduled release in early 2018. While some of the documents in this collection were declassified and deposited at NARA or the Lyndon Johnson Presidential Library in the late 1990s, many thousands of pages are being made available for the first time in more than 50 years. The documents in the files of the U.S. Embassy in Jakarta range widely, from the daily operations of the Embassy to observations on Indonesian politics, economics, foreign policy, military affairs, the growing conflict between the United States and Sukarno, the conflict between the Army and PKI, the September 30th Movement and the mass killings that followed, and the consolidation of the Suharto regime. While most of the documents in this briefing book concern the events of September 30, 1965, and their aftermath, we have included a handful of others to give a sense of the range and historical significance of the larger collection for an understanding of the broader consolidation of the Suharto regime. Thanks to John Roosa, Geoffrey Robinson, and Jess Melvin for assistance with selecting and annotating documents, Vannessa Hearman for translating this Electronic Briefing Book into Indonesian, and to Milorad Lazik, Luke Monteiro, Sarah Conroy, Jack French, Austin Koppel, Alan Gibson, Jennifer Satlin, and Ariel Santikarma for help with scanning and digitizing documents. 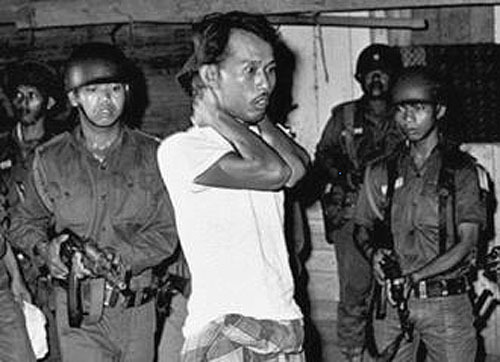 An alleged PKI member after his arrest by Indonesian security forces, October 1965.